i met him in our very first class on our very first day of high school. kind of a genius. he'd be the first one to tell you that. also, kind of goofball. he'd be the first one to tell you that, too. in fact, he pretty much reveled in it. tall, hilarious & outrageous, it didn't take long till we were like jenny & forest. what would we have thought back then if we'd seen this historic picture? I know I'd have been surprised. him, I don't think so. his name is mark, & he was going to be president of the sophomore class. that's what he said. i had my doubts. blue & white striped, high-water pants, red bow-tie with matching suspenders, plus a ridiculous, foot-tall abe-lincolnesque top hat -- pasted all over with white stars. not exactly what you'd call cool. but, that's what high school is supposed to be all about, right? not really. not if you're mark. he had something far better. confidence. it's one of the main things that drew me to him. i mean, opposites attract, right? but, did he win? that's what you really want to know. not even close. but, let's not focus on that, or the fact that he lost junior year, too -- there's more important parts of the story. "we'll be running-mates, martha," he said. "me, president, you, vice-president. it'll be great -- you'll see." i wasn't so sure. besides, me running for class officer? my opponent, the ever-smiling, everybody's buddy & champion gymnast, gerald martin did flip-flips across the stage to thunderous applause. all my skit amounted to was someone throwing a whipped-cream pie in my face. oh, the head-shaking irony.... yes, i know. now, please don't think for a second that i was bitter. are you kidding? nobody was happier than me. i was grateful mark was my friend & thankful, because i knew that because of him -- well, he made me better. here we are, all these years later, & nothing's changed. he's been mr. president for years now. his own huge company, enough accolades to fill that foot-tall, abe-lincolnesque top hat many times over, not to mention richer than God. & me? this past week, i achieved a lifetime goal. maybe you noticed that the count-down date for "The Most Exciting News on the Planet Earth," on the sidebar has expired. 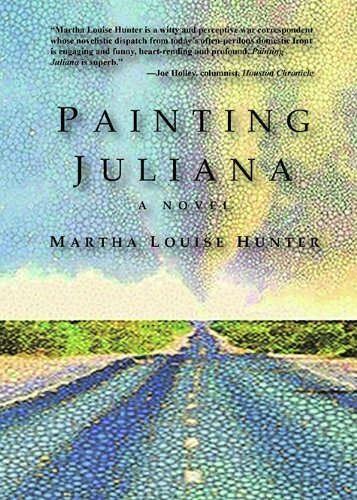 that's right -- my 1st published novel, painting juliana is finally out, glory hallelujah! who do you think threw me a book launch celebration? who was standing there to introduce me, propping me up with pride & adoration? well, it wasn't gerald martin. & in case you're reading this, mark, my cherished, loyal friend, thank you. even in four-inch heels, i'm still looking up to you.